przetestowanie procedur oraz niektórych wyposażeń naziemnych, które w przyszłości będą stosowane podczas przygotowań do startów rakiet Ares I, w tym testy sposobów odzyskiwania (wyławiania) pierwszego członu Aresa, który jest nieco większy niż standardowy SRB stosowany na wahadłowcach. dynamika lotu (pierwsza faza lotu) będzie będzie bardzo podobna do lotu docelowego Aresa, umożliwi to przetestowanie systemów kontroli. test separacji pierwszego i drugiego członu, w tym przede wszystkim silniczków: Booster Deceleration Motors-BDM (oddalających pierwszy stopień od drugiego) oraz Booster Tumble Motors-BTM (silniczki powodują obrót SRB zaraz po separacji w celu lepszego hamowania atmosferycznego). testy nowych spadochronów zaprojektowanych dla pięciosegmentowych SRB. Pierwszy człon: czterosegmentowy SRB taki jak stosowany w wahadłowcach, z tą różnicą, że na szczycie umieszczony zostanie dodatkowy "nieaktywny" piąty segment. Całość ma symulować rozmiar oraz masę prawdziwego pierwszego członu Aresa I.
Drugi człon (Upper Stage Simulator-USS): kształt, masa oraz położenie środka ciężkości ma być takie jak fragment prawdziwego Aresa I od łącznika pomiędzy pierwszym, a drugim członem do modułu serwisowego Oriona włącznie. Orion CM/LAS: makieta modułu załogowego Oriona (CM) oraz makieta systemu ratowniczego Launch Abort System (LAS). Symulator CM/LAS posiadać będzie około 150 czujników mierzących parametry dotyczące warunków: termicznych, akustycznych, wibracji i innych. Wszystkie dane będą przesyłane na bieżąco telemetrycznie oraz zostaną zapisane w First Stage Avionics Module (FSAM) znajdującym się w pierwszym członie w piątym segmencie SRB. Poniższy schemat pokazuje kolejność montażu poszczególnych elementów rakiety Ares I-X. 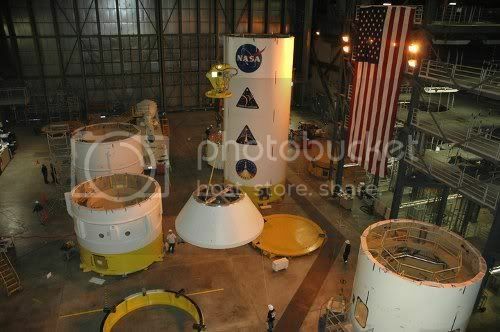 Po dostarczeniu do budynku VAB elementów: Orion CM/LAS, Upper Stage Simulator oraz piątego segmentu pierwszego stopnia, nastąpi wstępny montaż tychże segmentów w High Bay-4 zgodnie z poniższym schematem. CAPE CANAVERAL, Fla. — A one-of-a-kind NASA rocket soared into the Florida sky Oct. 28 in a brief but critical test flight of a new booster slated to launch astronauts into space and, eventually, toward the Moon. NASA’s Ares 1-X booster, an unmanned prototype of the planned Ares 1 rocket intended to carry astronauts after the space shuttle fleet retires, blasted off on an experimental mission from the seaside Launch Pad 39B here at the Kennedy Space Center (KSC). After several false starts due to bad weather, the rocket took advantage of a brief break in the clouds to loft at 11:30 a.m. EDT. Foul weather and a series of unlucky events foiled its first launch attempt the day before. NASA required good visibility for this first flight of the untried rocket. 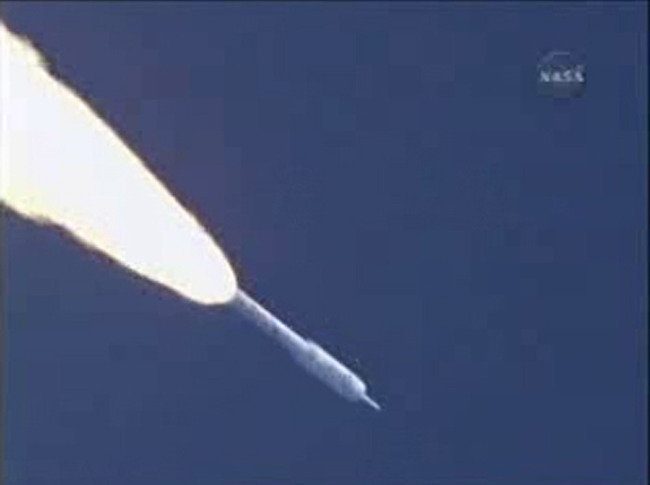 “Think about what we just did,” said launch director Ed Mango after the liftoff. “Our first flight test and the only thing we’re waiting on was weather. That says you all did frickin’ fantastic,” he told the team. The rocket lifted off despite a bout of thunderstorms that passed over it the night before. About 150 lighting strikes were seen to fall near the site, with four lightning impacts within about a kilometer of the launch pad. The countdown toward liftoff was delayed Wednesday morning while ground crews checked out the vehicle to make sure it suffered no lightning damage; luckily, the tests showed Ares I-X was safe to fly. “We looked at all the systems that could have been affected by this and all the data indicates that there was absolutely no real effect,” Ares 1-X deputy mission manager Jon Cowart said. The towering white booster rose into the sky toward the east, peaked at about 45 kilometers altitude, then dropped into the Atlantic Ocean, with parachutes softening its fall. By all appearances, the launch – which was aimed at demonstrating the rocket’s design — was successful. The mission is expected to return a wealth of data – readings from more than 700 onboard sensors as well as visual evidence from cameras on the ground and borne by flying aircraft. NASA engineers will pore over the information to study the rocket’s trajectory and performance to help confirm and shape the design of Ares 1, assuming the agency goes forward with the program. The teams plan to release periodic reports over the next three months to share the results of the fact-finding test flight. “We’ll come back and tell the agency and the public what we learned from the flight,” Ess said. An Oct. 27 launch attempt was stymied by clouds, winds and the threat of rain. If the rocket travels through high clouds it runs a risk of triggering “trioboelectrification” – static electricity that could interfere with sensitive onboard instruments. 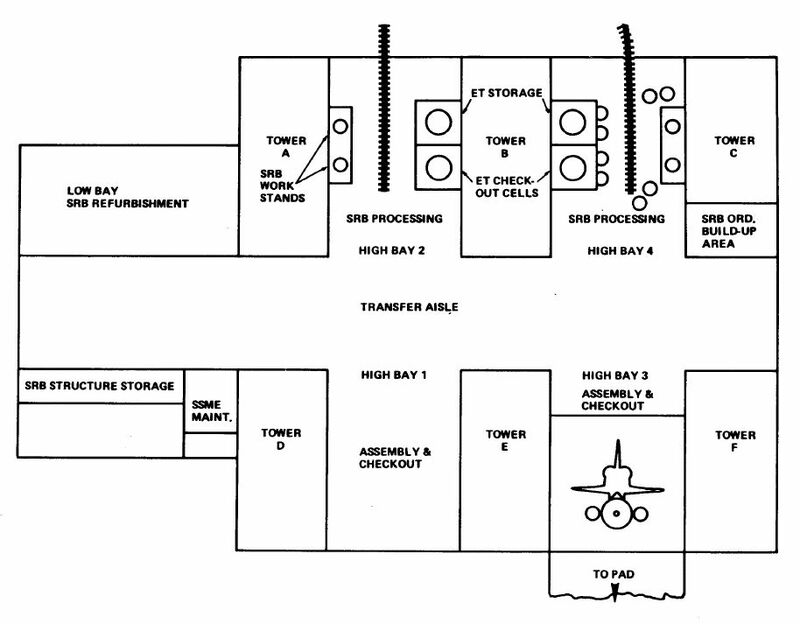 In addition to weather concerns, a stuck cover on one of the rocket’s probes stalled that morning, further delaying the countdown, and a freight boat later strayed into restricted waters close to the launch pad, thwarting one launch attempt. 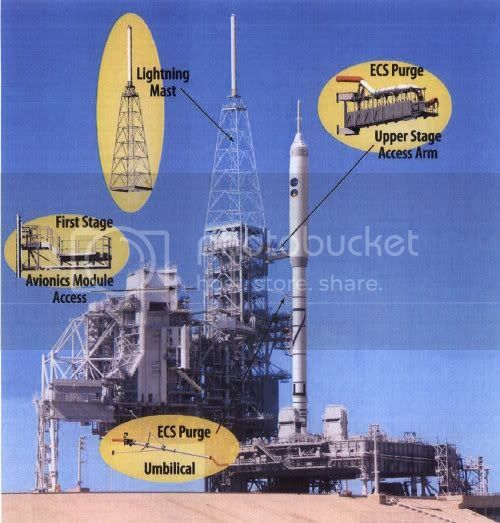 The 100-meter-tall Ares 1-X rocket was composed of a real first stage, with four solid-rocket segments and a dummy fifth segment on top. 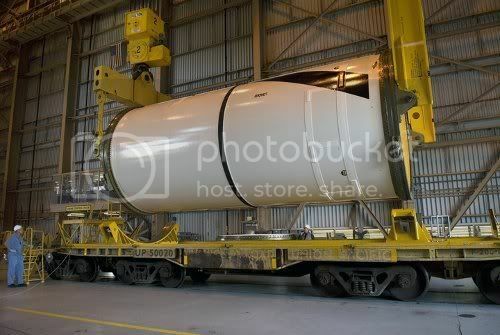 It also carried a simulated upper stage and crew capsule to mimic the intended size and mass of a full Ares 1 booster. The solid-rocket elements were based on the solid rocket boosters that help lift space shuttles into orbit. After liftoff, the rocket’s two stages separated as planned about two minutes into the flight when an explosive device along their boundary fired on schedule. The first stage sank under parachutes to be collected by boats from the sea so that its onboard data could be retrieved. The dummy second stage was left to sink into the Atlantic Ocean. 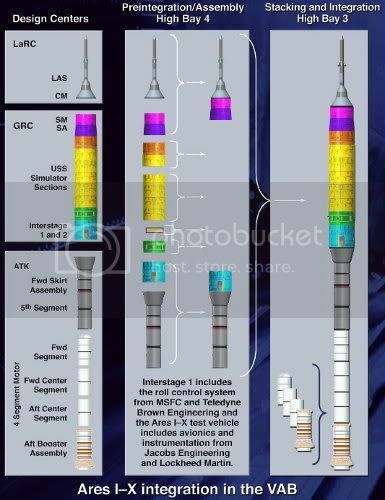 Despite the apparent success of Ares 1-X’s flight, the ultimate future of the Ares 1 rocket is uncertain. The booster was originally designed to replace the space shuttles as a vehicle to ferry crews to the international space station. But the station is set to be de-orbited around 2016 and Ares 1 is not likely to be ready before 2017, defeating much of its purpose, some experts have said. Last week, an independent review team appointed by U.S. President Barack Obama released a report detailing the status of America’s human spaceflight program, and outlined possible alternate visions for NASA’s future. The president is currently reviewing the report and is expected to make a decision soon about whether to proceed with the Constellation program, which includes Ares 1, or take the agency in a new direction. The report suggested Obama consider giving up on Ares 1 and instead urge private industry to step in and design a low-earth orbit vehicle for humans. That way, NASA could focus on building a heavy-lift vehicle to take people to the moon and Mars. Despite the doubts hanging over the program, and the perhaps unfortunate timing of the panel’s report being released less than a week before the Ares 1-X launch, mission managers say they are focusing on the task at hand. “The timing is what it is, but the test is significant and it’s one that we fully back,” said Doug Cooke, NASA associate administrator for exploration systems. 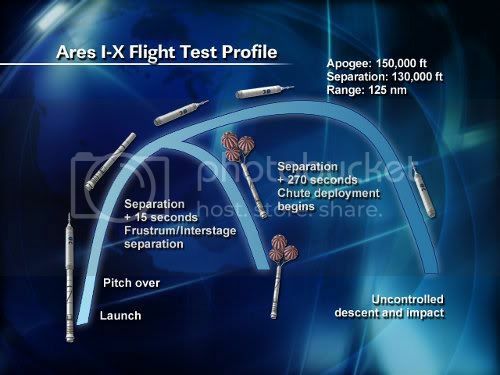 Mission managers said that even if NASA does not go forward with Ares 1, the Ares 1-X flight test provided useful data, not just about that particular rocket, but about the process of designing and building new rockets in general. “The data were going to get and the objectives we’re going to get are really germane to a whole class of launch vehicles,” Ess said. NEW YORK — NASA is still perplexed over the parachute failure that damaged its new Ares 1-X test rocket during its October test launch, but otherwise the debut flight went well, mission managers said. The $445 million suborbital Ares 1-X rocket, NASA’s first prototype of the vehicle it is developing to carry humans to orbit after the space shuttles retire, blasted off Oct. 28 from the Kennedy Space Center in Florida. It soared eastward into the sky, peaked at about 45 kilometers altitude, then the solid-rocket first stage separated from its dummy second stage and dropped into the ocean as planned. But two of three parachutes failed to deploy to soften the spent first stage’s splashdown. Consequently, the booster hit the water harder than expected, causing a huge dent and other damage. Since the parts are not intended to be reused, mission managers said the malfunction was not a major problem and they were able to gather all the data they needed. “We’re still investigating what happened there and why,” said Marshall Smith, chief of the System Engineering and Integration Office for the Ares 1-X mission, during a Dec. 3 news conference. Mission managers suspect that the chutes deployed earlier than planned, and thus took on more force than they were designed for, resulting in their failure. The towering 100-meter Ares 1-X rocket was loaded with more than 700 onboard sensors to gather data about the booster’s trajectory and performance. 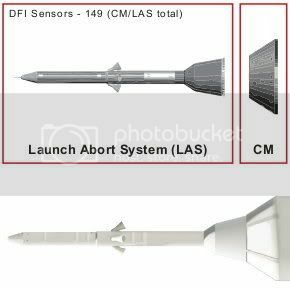 Among the promising signs revealed in the report was the fact that the rocket shook and rolled much less than some models predicted, which originally had been a concern for the Ares 1 design concept. 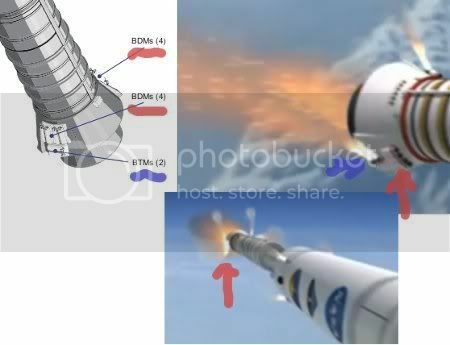 Additionally, early visuals raised some fears that the first and second stages might have hit each other, or “re-contacted,” after separation, but detailed analysis revealed that they did not. 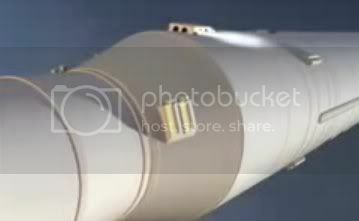 Additionally, three connectors failed to detach during the separation of the first and second stages. This was somewhat expected though, and the two pieces separated anyway, ripping the connectors. Another odd finding was the measurement of the structural damping, which is basically how much the structure of the rocket is able to resist vibrations, during the test launch. The booster experienced about 20 percent less damping than models had predicted. “I can’t tell you whether it’s bad or good — it just doesn’t match,” Smith said. The engineers plan to investigate that issue and others as they continue to review the data, which are still in preliminary stages of analysis. Almost all the data were recovered from the rocket when teams retrieved the stage from the ocean, though the data at the end of the flight were not recorded properly to the disk. But mission managers said they had other versions of that data and were more concerned with the ascent than descent anyway. “We’ve got loads of that data, so were not super concerned with getting that,” Smith said. 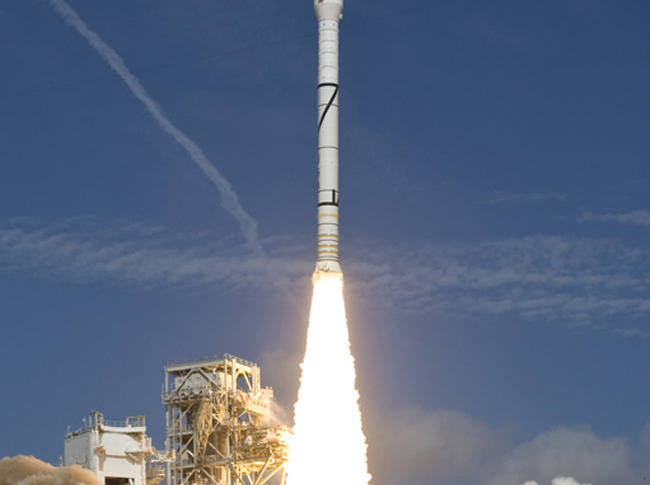 NASA is beginning to plan the next Ares 1 test flight, which is targeted for 2012.